The butter-versus-margarine debate is a slippery subject. 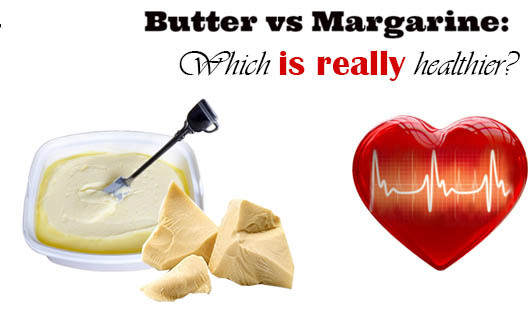 Some brands of margarine have unhealthy trans fats, while others have confusing health claims. Margarine is made from vegetable oils, so it contains unsaturated "good" fats- polyunsaturated and monounsaturated fats. These types of fats help reduce low-density lipoprotein (LDL), or "bad," cholesterol when substituted for saturated fat. But not all margarines are created equal. Some contain trans fat. In general, the more solid the margarine, the more trans fat it contains. Trans fat, like saturated fat, increases blood cholesterol levels and raises the risk of heart disease. In addition, trans fat lowers high-density lipoprotein (HDL), or "good," cholesterol levels. The American Heart Association suggests buying soft, trans fat-free spreads instead of regular butter or stick margarine. Choose a blend that contains the least amount of saturated fat and zero trans fats. Check the ingredients- if it says partially hydrogenated oils, it still has some trans fat (less than 0.5 g per serving), even if the label claims it to be trans fat free. These can add up if you have more than one serving. Recent health guidelines advise that men and women limit their saturated fat intake to 30 g and 20 g respectively per day, and consume reduced-fat spreads made from olive or sunflower oil as they are good replacements for butter. Most brands of margarine now contain nil or only trace elements of, industrially produced “trans fats” that are now known to increase the risk of heart disease, stroke, and possibly type 2 diabetes. Butter, when it comes to flavor and rich, creamy texture wins every time and because it is high in fat, is more satisfying and fills us up for longer. Butter is also one of the best dietary sources of Vitamin A, and also contains vitamins E, K, and D, and is a rich source of selenium. It’s the dose, not the poison that’s the problem, so balance is key!